This version of Blackjack is played with 6 decks of 52 playing cards and allows players to make use of the Super Match Bet, Split and Double. Players will have two hands open simultaneously and may switch with the second cards that are dealt to make their hand stronger and in turn better their chances of winning. The pay out is 1:1, with the insurance pay out being 2:1. The dealer needs to get 17 while he is also aiming to get 21. 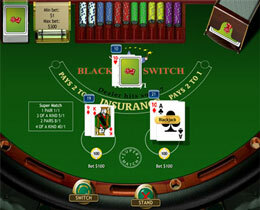 There are a number of chips to choose from and players must click on the chips to place their bets. The minimum bet is $1 and the maximum bet is $300 per hand, so when players have normal bets together with Super Match bets they will be playing with up to $900.